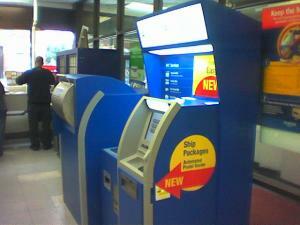 New Automated Postal Kiosk- It Really Works! I love the Post Office. Yes it’s true you read correctly I love the Post Office and if you could hear me you would know that there’s not a hint of sarcasm in my voice and I’m not winking or nudging. If you ask why I have to confess I’m not really sure. Maybe it’s a bit of nostalgia, after all I still anxiously look forward to getting the mail each day much like when I was a kid and would scream at the top of my lungs, “I’ll get the mail ” or “I’ll get it” when the phone rang or “I get the front seat” as I raced to beat my brother to the car. It might also be the strength and stability I associate with this austere quasi-government agency. In an age when everything from banks to public utilities have been bought, sold, merged, and have changed names about a half dozen times in as many years the Post Office still has most of the same branch offices, still offers many of the same products and services, and sometimes even has the same staff it did two decades ago much less two years ago. All this gives me a warm fuzzy feeling. It’s nice to know that while the world is rapidly adapting to the new digital world where information and documents whiz by at giga speed some things remain constant. Now as much as I like the Post Office I do have my pet peeves and critical feedback for them. I remember years ago my dad commented that the trouble with the Post Office was that you had to stand in line to buy a single stamp. He went on to explain that if you’re selling a product it costs a lot of money to wait on customers and you would never be able to operate efficiently much less offer good customer service if you have a bevy of senior citizens in line to drop some lose change to buy a stamp or two. That idea made a lot of sense to me. In graduate school I collaborated with two fellow students on a project where we chose to address the problem. Anthony, Camilla and I created a conceptual prototype postal kiosk. easyPost was our answer to much of what ails the post office and its customers. Our solution let customers weigh, stamp, and post packages all in one box (see photo below). It was the late 90s and our rationale was simple; consumers were already growing accustomed to self-service shopping- from delving directly into a company’s computer system using digital interfaces on web sites like Amazon to self-checkout in grocery stores where the cashier was replaced by the customer scanning their own products. We imagined that easyPost would replace the analog postage vending machines currently in use that only let you pay cash to buy a single stamp or book of stamps. easyPost would accept cash, credit, or debit cards and would let customers weigh their package and print a stamp in the correct amount for their package. It also would let customers add services like registered or certified mail and insurance to their package using a handy keyboard embedded in the kiosk. Well Hallelujah it’s now nearly 2005 and Post Office has finally introduced their own version of easyPost, the Automated Postal Center or APC. 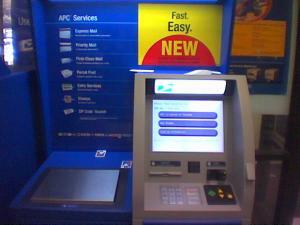 The APC is not as easy to say, is quite a bit larger, and not nearly as aesthetically pleasing or fun to use as our easyPost concept kiosk but hey we’ll put all that aside for the time being- it is the Post Office after all. The APC actually looks like three separate machines rather than one wholly integrated kiosk but it is here and it does work! And yes not only is it easy to use but it’s fast! On a recent visit to the Post Office I avoided the 8 person deep line and according to the time on my receipts I completed two separate transactions (I decided to buy a book of stamps after I mailed the first package) in exactly two minutes! As I quickly navigated through the touch screen interface and made my choices I noticed what appeared to be a small camera by the screen that I surmised to be for security purposes to link mail items with the people sending them. I’ve since learned that the APC takes portrait-style photographs of customers and retain them for 30 days on a Windows XP platform, and won’t function if you try to inhibit the camera and that there’s a privacy controversy brewing over the issue. As I finished my transactions I glanced over at the line behind me and with a little smirk I acknowledged that it hadn’t moved at all. And all except for the last guy in line who was looking over my shoulder through the whole transaction no one seemed to notice me or the kiosk as they anxiously tapped their feet, talked on their mobile phones, and complained to each other about the long line. As I walked out the door I saw that last guy take my place at the kiosk. In just a matter of minutes I was in and out of the Post Office in my car and on my way with a sense of satisfaction that I typically feel only when checking off items on a long to do list. I’m so excited that the APC is finally here I’m not even going to complain about the design. The interface works well enough right now and in due time I’m sure they will enhance it. Now if anyone at the Post Office is reading this I hope you add new services like certified mail and start installing them in places that are open late night or 24 hours, hey Kinkos you hear that! Next PostWired Headsets Dangerous – Thanks Bluetooth!